This is the first of an indeterminate number of posts detailing some of the crazy finishes of LSU games in recent years. I made 2000 the cutoff for these. Saban (whose first year was 2000) had some crazy endings too, but I think for an established top team like LSU to have so many crazy finishes is one of the things that has made the Miles tenure unique. I won’t categorize them all by team. Some might be by year, for instance. This isn’t too relevant to anything this season, but this is mostly laying the foundation for the 2010 game, which was similar in a way to the Ole Miss win on Saturday. The Tigers gained a fair number of yards, certainly more than the other team, but still didn’t manage to win without a lot of drama. Also, the pullover Dooley liked to wear and the background to the Tennessee press conferences were primarily black with some orange (third video), so I guess it’s not a bad thing to post on Halloween. I guess you could say LSU came back from the dead to win that game. 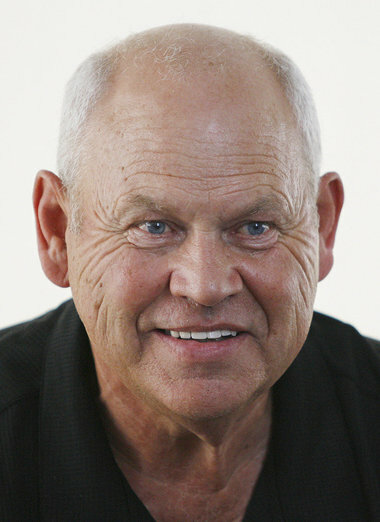 Also, Philip Fulmer looked like a strange troll or something. Anyway, this series isn’t played often, but there have certainly been some memorable games even going back to Nick Saban’s first season at LSU. One of the defining games of that first season was an overtime win over #11 Tennessee. LSU really needed a win after losing by 17 on the road against a ranked Auburn team and then coming home and suffering an upset to UAB. If LSU loses that game for a third consecutive loss going into the Florida game, things would have looked pretty bleak. At the time, it was only LSU’s fourth win over the Vols in history (in 25 games). So even though they got blown out by Florida anyway, I still think that Tennessee win was very helpful to the team going forward. After Florida, the Tigers won four in a row, becoming bowl eligible for only the fourth time in 12 seasons. The end of the game was interesting. LSU had a 46-yard field-goal attempt blocked, leading to the overtime period. The Tigers scored a touchdown on their first play in overtime. After two plays of their possession, Tennessee had the ball at the LSU 11 with a first down. On second down, the Vols advanced the ball to the LSU 4, but the Tiger defense held, giving LSU the win after two incomplete passes. There was a fairly close loss in early 2001 at Tennessee, but LSU once again didn’t start out that season well and Tennessee was in the top 10. Tennessee was poised to go to the national championship game when they (surprisingly) met the Tigers again in the SEC Championship game. I say surprisingly because LSU started SEC play 2-3. The Tigers were not intimidated though. After facing an early 17-7 deficit, they would outscore the Volunteers 21-3 in the second half, finally putting the game out of reach with a touchdown to go up 11 with just over two minutes remaining. When I saw the snap in the waning seconds of the LSU @ Tennessee game in 2010, I turned off my television in disgust. After angrily pacing around and grabbing some refreshment (I do not recall if it was an alcoholic one), I turned the TV back on in time to see what appeared to be an emotional Tennessee player, but he didn’t seem happy. Then I saw what seemed to be a replay of an LSU touchdown. Not from the game I saw. The only LSU touchdown in the game I saw was a long run from about midfield by LSU QB Jordan Jefferson. At some point I saw the score. I wear glasses, so I questioned whether the “6” I saw was really a 6 or whether it was the “0” I had seen when I was turning the TV off. Even if you don’t want to watch the whole thing, after the errant snap I mentioned, you can see Derek Dooley apparently trying to get off the field and take his team with him. Curiously though, the officials (often the first people off the field) hung around. More than a minute elapsed before there was any suggestion that there might be another play. Another 30 seconds later, and the call was finally made. Illegal participation on Tennessee. When the announcers count them, there were 13 Tennessee players. Dooley’s explanation of events is possibly even more fascinating. He mentions that CBS was trying to interview him and he was glad he didn’t do that. Incidentally, Dooley had given LSU just about all they could handle as the head coach of Louisiana Tech the season before. The Bulldogs only lost to the #9 Tigers by 8 points. That’s one reason I always sort of defended him, but he did seem out of his depth in other SEC venues at times. Back to the end of the game, I understand at this point that Miles had lost communication with the press box. Miles had retrieved his headset, but I guess Gary Crowton, who was then the offensive coordinator, was on his way downstairs. I don’t think coaches normally hang around a press box when a game appears to be over. Anyway, the way Miles discusses it, he made the play call himself. The next snap was not made until nearly three minutes after the previous one. This was Les’s rambling after the game. Unlike Dooley, he doesn’t get around to describing the end of the game until about 3:45. He was responsible for the final play call (the successful one) but didn’t have a good answer as to why so many seconds ticked off the clock before the illegal participation. One of the reporters mentions toward the end that LSU had a lot more yards than Tennessee but (obviously) had trouble turning yards into points and also committed four turnovers. Sounds familiar. LSU blew out Tennessee the following year in Knoxville, and the two have not played one another since. It’s unclear when they will play again, but no sooner than 2016 (unless somehow Tennessee and LSU both make the SEC championship game or the same bowl/playoff game next season). There have been a lot of people who have looked at the top four – whether it was the CFP’s or the mock BCS’s or my objective computer ratings – and have gotten all upset that it contains three SEC West teams. First of all, that kind of consensus tells you they’re wrong to complain; but secondly, people forget this isn’t an 11-team Big Ten with an 8-game schedule and no championship game. No one is just going to avoid another top team or two and coast to the playoff. Every team in the SEC West has to play every other team. The remaining battles start on Saturday, when Auburn plays Ole Miss. I can pretty much guarantee you they won’t both stay ahead of Florida St. and Oregon if the Noles and Ducks both win this weekend (if you count Thursday night). It is impossible for any combination of three SEC West teams to finish with one loss or fewer and therefore extremely unlikely that three of them would be in the top 4 at the end of the year. Each of the four teams at the top of the SEC West right now has two games left against the other four. Auburn plays Ole Miss and Alabama; Ole Miss plays Auburn and Mississippi St.; Mississippi St. plays Alabama and Ole Miss; and Alabama plays Mississippi St. and Auburn. That’s not to mention the fact that two of the teams (Mississippi St. and Ole Miss) still have to play Arkansas. I know the Hogs are winless in conference, but their only losses are in the SEC West and to the best team in the SEC East so far, Georgia. The only other loss from outside of this top group was in overtime to Texas A&M. Also, they put a scare into Alabama, so they can knock off one of these teams. Speaking of Alabama, even though they got past Arkansas, they have to win in Tiger Stadium at night in about two weeks. They have done that a couple of times in recent years, but it wasn’t easy. They needed to win in overtime in 2008 (even though that was the worst team Miles has had at LSU and the Tide were undefeated at the time) and in the last minute in 2012. Auburn has to play Georgia, which appears to be the top team in the East, also on the road. Speaking of Georgia, they’re the one SEC team that I could even imagine causing three of the top four to be SEC. Mississippi St. and Alabama could each finish with one loss (if Alabama wins out and Mississippi St. wins out apart from the Alabama game). Alabama could be consensus #1 and go into the SEC championship game against Georgia (who themselves could win their remaining games). Georgia could win the SEC. I’m not sure if a loss to another one-loss team in Game 13 of the season knocks a team down from #1 to #5, but if I were a one-loss Oregon team, for instance, I wouldn’t want to have to find out the answer to that question. On the other hand, LSU’s only losses are to two top-5 teams and they’re way down at #19 despite beating the committee’s #4 team last week. So the committee probably wouldn’t even allow that scenario to happen. Speaking of LSU, they could be a catalyst for the SEC having just one team in the top 4. The Tigers are not eliminated from the SEC West. Alabama and Ole Miss beat Mississippi St., and Auburn could beat Ole Miss but lose to Alabama and possibly one other team (Arkansas and Georgia are possibilities). There would be nothing particularly strange about any of those results. If there were a 4-way tie without Auburn under the above scenario, LSU would win the tie. LSU and Ole Miss would both be 2-1 against other teams in the tie, and then the resulting 2-way tie would be broken by LSU’s win over Ole Miss. There could be a 5-way tie, but unless one of the losses is to another team (such as Arkansas or Georgia), everyone in the tie would then be 2-2 against the other teams. This tie would then be broken by best SEC East opponents, which right now would be won by Auburn with LSU a close second. LSU’s opponents would have to be better (and not even) because they would obviously lose a 2-way tie with Auburn. Anyway, even if Georgia wins out, they already have one loss, so a loss in the SEC Championship Game would give them 2 losses. If the entire SEC has at least two losses, it would make sense to give the champion a spot in the top four and no one else. It doesn’t take anything crazy though for the champion of the SEC could have one or no losses and everyone else could have 2 losses. This would also probably result in only that one team in the playoff. So it seems nearly impossible for there to be three SEC teams in the playoffs, more likely than not for there to be two teams, and quite possibly just one team. Mississippi St. winning out will make sure everyone but Auburn finished with at least two losses. The chances are pretty good that Auburn will lose a second game anyway. I, on the other hand, want to see LSU get as close as they can. I’m going to do things a little differently this week. To avoid confusion, I’m omitting last week’s rankings from the chart (I will discuss movement of teams in the discussion below). I’m listing my top 25 in order and to the right, I’m first listing the college football playoff top 25, followed by a mock BCS (I’ll just call it BCS from now on since there is no “real” BCS ranking anymore) ranking. There are 36 teams that got at least some level of points under this approximated BCS system, so I’ll mention those who aren’t in my top 25 afterward. The BCS formula can’t be completely replicated because there is no longer a Harris poll, and one of the computer systems (Massey) no longer lists ratings that comply with BCS rules, which included a ban on any consideration for margin of victory. I think I’ve made a pretty good approximation by using the AP poll and Massey’s “normal” ratings. At least we can all agree on #1. I don’t have time for too much editorializing, but before seeing these I already thought it was an oversight not to have a system that was at least partially objective. I’m not going to judge the whole thing on one rankings list, but based on what I see here, I would have preferred to keep something like the BCS formula and pick the top four from that. I know people who don’t understand how my system works won’t be happy with these. Last week, Ole Miss was technically #1, but I just didn’t rank them as such on my blog because I wanted to see if they would beat LSU before taking that step. I’m glad I made that choice. Anyway, the question remains: how do they only lose one spot? I even thought I might have made a mistake, but I’ll explain. The first thing I wanted to mention is they’re actually #4, behind Auburn and Florida St. (who have had two byes apiece) if you divide the overall rating by playing weeks. 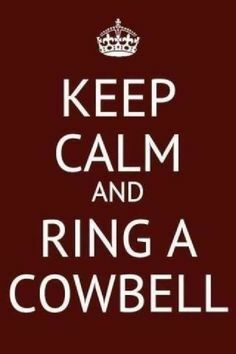 It also helps that Ole Miss started out a large distance over #3. A normal distance from one team to the next is about 0.02. Ole Miss was 0.12 ahead of last week’s (computer) #3, Florida St. Losing to LSU only subtracts 0.09 from Ole Miss’s score. Ole Miss still goes from 0.04 ahead of Mississippi St. to 0.14 behind. For context, in last week’s ratings, 0.14 was approximately the distance between #6 Oregon and #16 LSU. There just aren’t teams between the two in this case. Just as an aside, this week LSU was only 0.04 short of the Ducks. With Florida St.’s bye week (most teams lose at least one spot in a bye week), Ole Miss was able to stay ahead and Auburn was able to pass them up. I understand one may object to two one-loss teams being ahead of Florida St., but at the end of last regular season there was just one, and at the end of this year there will likely be one. Someone has to lose Auburn-Ole Miss next week. It’s not guaranteed Mississippi St. will get past Alabama and Ole Miss. Also, someone has to lose between Alabama and Auburn. Auburn also has to play Georgia. So there are plenty of future opportunities on here for Florida St. to move back up. Even if Ole Miss beats Auburn next week, they will then have a lull in points. They play Presbyterian College the following week, followed by a bye. Florida St.’s opponents of Louisville, Virginia, and U. Miami should pick them up a bit relative to Ole Miss. Alabama plays LSU and Mississippi St. on the 8th and 15th, respectively, but next week they have a bye week, and on the 22nd they play Western Carolina (while Florida St. will play Boston College that week). Once again, Auburn is a potential one-loss team that Florida St. may have trouble catching. Florida St. could be no better than third if both Auburn and Mississippi St. win out. Auburn would have a bye week during the championships in that scenario, but a win over Georgia to go along with the SEC West wins would still be difficult to overcome. If South Carolina and Kansas St. win the rest of their games, Auburn would have a very large number of points from those as well. My computer ratings are a lot more fluid than the polls. I’ll give a couple of examples. When I had Alabama ahead of Auburn last week, that clearly did not mean that if both won they’d remain in the same positions. The teams are basically in a race. If you’re ahead in a race and neither you nor your opponent fall down, you’re not guaranteed to finish ahead. Also, I said that teams playing tough opponents can pass up Marshall. Even though LSU was 9 spots behind, they did just that with the win over Ole Miss. Granted, many teams would have to win two games instead of one to make that distance, but it’s not as difficult to move up as it would be in the polls. Nebraska was 7 spots behind Marshall and also passed up the Herd by beating Rutgers. Marshall has a bye next week so will most likely be passed up by even more teams. Michigan St. is also idle, but then Sparty will have a good chance the next week against the Buckeyes. In addition to Kansas St., it’s also helped the SEC West that Boise St. (beaten by Ole Miss) and West Virginia (beaten by Alabama) have continued to move up. Both are now in the top 25. Wisconsin (beaten by LSU) is one of the next 10 teams out. Also, SEC West teams have now swept three of the top five SEC East teams, Kentucky, Florida, and South Carolina. Georgia has the only win against the SEC West by any team in college football from outside of the SEC West, but the Bulldogs will play Auburn in a couple of weeks. Missouri has yet to play an SEC West team. Not that it helps much, but Tennessee was also swept by the SEC West, and Vanderbilt lost one and has one to play (against Miss. St.). The top five teams of the SEC West are still undefeated against all outsiders. As mentioned, there are some really quality wins over those outsiders. LSU is the only one of the five who has lost twice within the group, but that’s about to change with the Auburn-Ole Miss game. 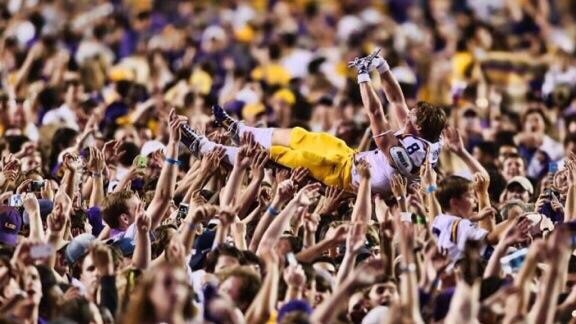 LSU Freshman WR Trey Quinn surfs the crowd after the win on Saturday. A few preliminary things. I updated the chart I made a few days ago with Ole Miss’s performance against LSU when renked. 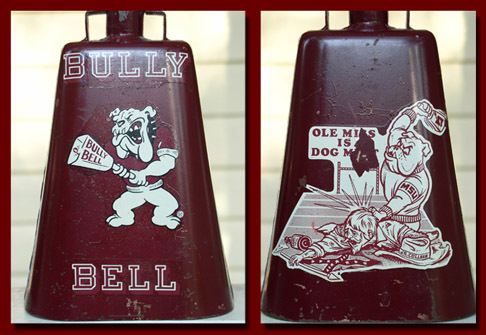 Their last win over LSU when both teams were ranked was 1962. I also updated the blog about the overall series that I published here for the first time in 2010. Next week, I will release my top 25 blog, but you can already click the heading “ratings site” to see the full list of teams. Since LSU has a bye week and just had another game with a great finish, I think this week will be the perfect time to the blog I’ve been planning on with the crazy LSU finishes over the last 15 years. It will also be fun because obviously the next game is Alabama, and there were some crazy finishes when Saban was at LSU too. It’s not just a Miles thing. If you want to get an early start on Alabama, I also have a blog about that series of course. On to the game, I was leaning toward Ole Miss winning, but for some reason I’ve been picking the wrong teams in close games the last several weeks. I also picked Penn St. and USC, for instance. However, I had a feeling it would be a game like the one that was played and that we would see an improved LSU team from Miss. St. and Auburn. A couple of guesses for potential LSU wins were 17-14 (the score LSU won by in 2003) and 17-16 (the score LSU won by in the disputed 1972 game). I knew there was a risk Ole Miss would get things going on offense, so I thought they might win by something like 27-24 as they did last year. If things went more poorly for LSU, maybe 28-17, something like that. The LSU defense was dominant at times, but what I like about this defense is if you get one first down you’re not off to the races. You have to fight for the next one and the one after that. So it stopped or drove Ole Miss back at least three times from borderline field-goal range. There were a few other key stops in the vicinity of midfield as well. If you had told me the final score would be 10-7, I would have known that favored LSU. As a fan, I feel vindicated by this game. When we went to Oxford last year, we were still playing for a national championship, and we got derailed by Ole Miss with a late field goal. Ole Miss only has one loss, so they’re not out of it, but it was still nice to return the favor. Also, in 2009, we made some mistakes right at the end that potentially cost the game as well, so I felt like this helped even the score. Down by 2, the Tigers drove to the Ole Miss 32, the edges of field goal range. After an incompletion on first down, LSU went backwards. QB Jordan Jefferson was sacked, knocking the Tigers out of field goal range, but it was only third down. When the play ended, 17 seconds ticked off the clock before LSU called a timeout. Miles said he thought a timeout had been called, but the clock ticked down from 0:49 to 0:32 before it was actually stopped by that timeout. LSU then lost more ground on third down, leading to a 4th and 26 with 9 seconds left. I don’t know what that took up so much time either, but the Tigers completed a 42-yard pass for a first down at the Ole Miss 6. They could not get the final play off though, and the game ended. 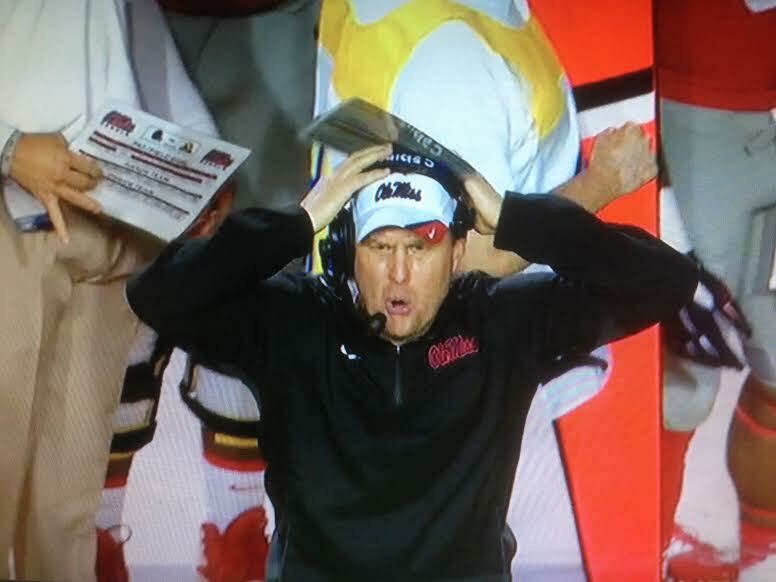 Ole Miss Head Coach Hugh Freeze reacts to the late interception. We did get wins over the Rebels in 2010, 2011, and 2012 of course, but it’s nice to get one back that they likely feel they should done better with clock management to give themselves a chance at coming back at the end. To be honest, I thought that might be the kind of thing LSU would do at the end of the game. It also adds something to the fun when you get a win as an underdog. If you’re supposed to win, it’s usually just more of a relief instead. LSU has not beaten Ole Miss by more than 7 points at Tiger Stadium since 1995, but somehow LSU has won 6 of the last 7 at home against the Rebels. 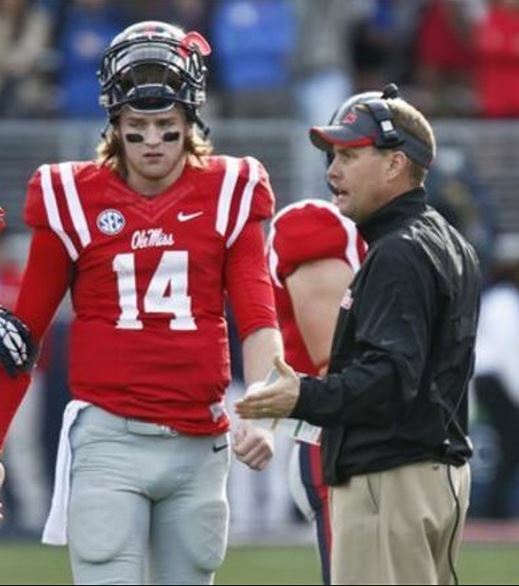 Ole Miss has still won two of the last three at home against LSU after four straight losses. LSU is now 24-23 under Les Miles when trailing at some point in the fourth quarter, not only the only team with a winning record but also the only team over 35% in such games. Texas is second since 2005 in both wins (18) and winning percentage (34.6). Here are a couple more factoids for you: In the last 20 years, only 2 teams have defeated a Top-3 opponent while scoring 10 or fewer points… LSU did it both times: 2011 at No. 2 Alabama (9-6) and 2014 vs No. 3 Ole Miss (10-7). LSU has won 5 out of six games when hosting top 10 teams since 2010. I shouldn’t have to mention the exception. I correctly anticipated Anthony Jennings would feel the pressure, but I was pleasantly surprised that he seemed to handle it better than Bo Wallace did. While he did turn the ball over twice, they were both long throws and the defense performed well to keep them from being very damaging. Also, it didn’t seem to damage his ability to focus and handle the rest of the game. Bo Wallace, by contrast, really seemed overwhelmed at times, and not just when he head-butted an LSU player or when he started jawing with the crowd (It reminded me of when Tim Tebow tried to show up the LSU crowd in a loss). He did not turn the ball over until his last throw of the night, but that was obviously a lot more crucial of a mistake. Also, the interception that was negated by a pass interference was a horrible throw. It was arguably uncatchable, but I’ve studied this rule at length since the Auburn game in 2006 (when LSU was denied an obvious pass interference when the referees picked up the flag). It has to be very clearly uncatchable or it is interference, so the call could have justifiably gone either way. The interpretation that likely prevailed was that the receiver theoretically could have fought off two defenders (the one flagged and the one who caught the ball) and made a play on the ball, but that doesn’t mean it was anything but a bad throw. Ole Miss’s only score was technically off of a turnover, but it still required an 80-yard drive. So the Tigers really should have been ahead in the early going of the game since one of the fumbles was at the Rebel three-yard line, and after another good drive the LSU kicker missed a 28-yard field goal. He would also make a 21-yard field goal (which was ultimately necessary for the win of course), but that also indicates how close they were to more points on that possession. Time of possession is widely considered over-rated, but not for these teams in this game. If your defense needs to hold the other team to 7 points, you want them on the field as little as possible. 36 minutes of possession is pretty substantial. It seems especially crucial for this LSU defense, which got shredded by Wisconsin, Mississippi St., and Auburn, but only when the Tiger offense could not move the ball against those teams. I REALLY don’t mean to slight the Ole Miss defense here. I don’t blame them for giving up these yards given the time of possession battle I mentioned. Also, LSU was not just clumsily tossing the ball around and dropping it. The “land sharks” (classic SNL references ftw) deserve primary credit for least three of the four LSU turnovers, and partial credit for the other one. Stopping a team at the three with a turnover is still a stop even if they drove 96 yards to get there (it was actually 69). As if the game wasn’t emotional enough, I just want to express profound sympathy and admiration for what Miles has gone through over this time. I don’t know how he does everything he does under normal circumstances, but with how big of a game this was and the media circus and so forth, I don’t know how you can deal with all that and the loss of a parent in the same 24 hours. “When The Golden Band From Tiger Land plays the “Duuuun, dun, dun, dunt” – those four notes that send chills up the back of the Tiger faithful, the Chinese Bandits reemerge. Billy Cannon slips through another tackler. Bert Jones gets another second on the clock. Hodson hits Fuller in the back of the end zone on 4th down again. Matt Mauck finds Skyler Green one more time. Tyrann Mathieu returns that punt against Arkansas down 14-0 and the ghosts cascade down onto the field with the roar of 100,000 wild Louisianians and the dreams of opponents begin to die. In probably the most famous LSU-Ole Miss game, Billy Cannon runs back a punt for LSU’s only score of the day (apart from the extra point). Ole Miss was also #3 at that time.. Overall, Ole Miss is 8-6-1 when ranked and playing LSU, 6-5 in Baton Rouge. LSU is 6-2 when both teams are ranked, 5-1 at home. I just use the AP ranking since that’s what my references used. *This was in the Sugar Bowl on January 1, 1960. It is officially the only neutral game in series history. All other games played in Louisiana are considered home games for LSU; all games played in Mississippi are considered home games for Ole Miss. I hadn’t really talked about just how LSU is coming along as a team and x’s and o’s in a couple of weeks, so I thought I’d do that now. 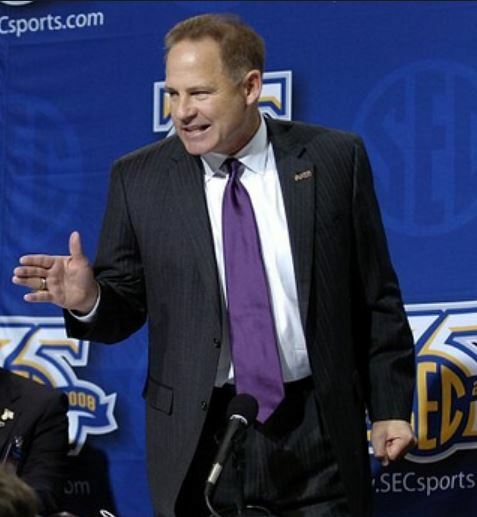 Miles tells reporters to “have a great day” before LSU beat Tennessee to win the SEC in 2007. This last game was Les Miles 100th win at LSU. Maybe it’s appropriate that we didn’t beat Mississippi St. in the last second. It just would not have been fitting for win #100 to have been a blowout win over New Mexico St. Florida was the 23rd Les Miles win in which the Tigers trailed at some point in the fourth quarter. That’s nearly 1/4 of his wins. To refer to one of his quotes in the video, it does seem like LSU’s game plan includes a “muddle around” period. LSU is .500 in such games under Miles, much better than any other team. I read that Texas is second with 18 wins after trailing in the fourth quarter, but that’s against 32 losses. I added a new section to the LSU/Florida rivalry blog about how this was similar to a couple other wins at the Swamp in the last 10 years. I also wrote a complete LSU/Kentucky rivalry blog. I was counting on Jeff Driskel to screw up and hoping Anthony Jennings didn’t screw up too badly, and that’s about what happened. I did think LSU would manage more than 110 passing yards for the game though (41 were on one play, and the only passes of more than 10 yards were in the fourth quarter). That’s the main problem that I didn’t foresee going into this season. I thought we would be consistently 225-250 yards per game passing by this point. LSU does still average 205 per game, which isn’t good, but it’s deceivingly good nonetheless. It’s inflated by the Mississippi St. game where LSU threw for 341 yards, most of them in a second-half comeback effort. The other major area of weakness so far has been rush defense, but I think this game was a much more reasonable gauge of that than Auburn or Mississippi St. were. LSU only allowed 123 rushing yards by Florida. That’s respectable against a team that had about twice as many rushes as completed passes. Especially a fairly competitive SEC team (they weren’t pretty games, but the Gators are 2-0 in the East) in a road game. When I watched TCU on Saturday, I was reminded of the difficulties LSU had in kick coverage against the Horned Frogs last season. It was weird that they demonstrated precisely the problems I remembered, especially being that Dubose had run back a kick for a touchdown against LSU before. LSU seems to have a reasonably good location punter. I don’t know why they waited until the last punt to kick it out of bounds. So basically they replaced the rush defense problems with the kick coverage problems. Otherwise, this might have been a somewhat comfortable win. Back to the rush defense, this next game might tell a bit more. LSU has struggled in the past against the wildcat, but I don’t think Kentucky has the likes of Felix Jones and Darren McFadden. Also, the scouting reports indicate Kentucky has very little ability to throw from the wildcat, so that might be a comfort. I think I’ll be more worried about the other plays. QB Patrick Towles has completed over 62% of his passes and has thrown for over 1500 yards (more than 8 yards per attempt). He also can throw to just about any wide receiver on the field, which can strain pass coverage of course. On the other hand, many of those yards came against UT-Martin and Florida (which was a 3OT game). If you take out those two games, Kentucky has fewer passing yards per game than LSU does. Towles can run a little bit though. He’s no Dak Prescott, but he ran for 59 yards against Ohio, for example. I didn’t mention place-kicking earlier. I didn’t see anything wrong with the missed extra-point attempt other than it missing. Hopefully, that was just a fluke event. PK Colby Delahoussaye said he just got too close to the ball. At any rate, it was nice to make up for it with a 50-yard field goal. It’s good to know he can do that. Not to delve into philosophy too much, but he probably wouldn’t have had a chance to win the game had he made the extra point. Florida likely would have gone for the end zone had they trailed by four. If rather than a tie game, Florida had a three-point lead on the last drive, Driskel may not have thrown the pass that was intercepted. If Florida had failed to score altogether, the kick at the end would not have been necessary either. Anyway, because of some of the things I mentioned earlier (as well as the recent LSU-Kentucky games I wrote about in detail ), I ‘m thinking of doing a blog about crazy LSU wins. There was a fair number under Saban as well. Seasons like this one might be an exception (assuming we lose four or five instead of two or three)., but Saban’s teams tended to be a little more unpredictable overall, so that helped. I don’t think they had the same knack for falling behind teams they shouldn’t though. Currently, LSU has won three in a row at home and five of six in the series overall. Also, in three of the last five and four of the last eight games in the series, four points or fewer separated the two teams in regulation. Kentucky won two in a row at home 3 times, 1954-6, 1974-6, and 1993-5. The Wildcats never won consecutive games in Baton Rouge. I mentioned in the last blog that I had done this same basic blog before on TSN. I believe that blog was done before the 2007 game. That will be one of three specific games I’ll talk about in detail, but first I just wanted to cover the major developments in the history of the rivalry. Before the SEC went to the 5-1-2 scheduling system (I’ll explain) in 2003, LSU had played Kentucky in 51 consecutive seasons. There were only two games before that streak began, but I suspect the annual nature of the game was because neither team had particularly clear rivals in the SEC. Kentucky’s closest rival is Tennessee, but the Vols have bigger rivalries with both Vanderbilt and Alabama. That LSU-Kentucky streak of games began in the waning days of Tulane’s membership in the SEC. The only other must-play conference rivals for LSU were Mississippi St. and Ole Miss, at that time the only SEC schools in neighboring states. Florida and Alabama didn’t become annual series for LSU until 20 years later. The head coach of Kentucky the first time the Wildcats played LSU was none other than Bear Bryant, who always seemed to give the Tigers trouble. His teams shut out the Tigers the first two times he faced them, before LSU beat Kentucky in his second-to-last season there and tied them in his last. Bryant’s successor had three decent years after he left (I guess until the talent dried up), and the Wildcats beat the Tigers two of the next three seasons to go out to a 4-2-1 series lead in 1956. The 1950s were not particularly good for LSU until 1958 though. LSU was #1 again for most of 1959, so they beat Kentucky for the third straight time that year. Kentucky got one back in 1960 (both teams were barely above .500 that season) but then lost the next 13 games in a row in the series. The Tigers have had a commanding lead in the series since then. LSU had a winning record every year during that time, but Kentucky only had one. The Wildcats won three out of four from 1974 to 1977, but the Tigers lost 4 games or more in each of those years. Kentucky also had a little bit of a revival during that time, building up to a 10-1 season in 1977. Ten of the next 11 were won by LSU. while Kentucky went back into the pattern of having a losing record almost every year (although not as badly). The Wildcats beat the Tigers during one of only two winning records over that period, 1983, one of the worst LSU seasons since that 1958 national championship. LSU’s next 4-7 season was in 1989, and that was the next loss to Kentucky (who had a relatively good 6-5 season). The following loss to Kentucky was in the 1992, the worst LSU season since 1910. “LSU continued its losing ways almost throughout Curry’s tenure at Kentucky, but the Wildcats didn’t fare much better. 1992 and 1994 were probably the sorriest match-ups during that period. 1992 was Curry’s only win with the Cats in Baton Rouge, but LSU would finish 2-9 and Kentucky would finish 4-7. In 1994, Kentucky’s lone win of the season was over Louisville in the opener. They still managed to make it close against LSU, losing 17-13 in Baton Rouge. LSU finished 4-7. Kentucky would go 5-3 against LSU from 1992 to 1999. The only one that was really an upset in hindsight was in 1995. LSU had its first bowl season since 1988, but they struggled on the road that year, going 1-3-1, the only win coming against a Mississippi St. team that would go 3-8. Kentucky only went 4-7 that season, but they did get the Tigers at home. The Tigers have won 5 of 6 since then, but there was one major upset (the one loss) and a close call in another. 2002 wouldn’t have been a huge upset since that wasn’t a very good LSU season (thankfully 8-4 isn’t what LSU fans call a good season these days), but it was the second consecutive year that the Tigers won in the last 15 seconds. I will detail those three games below. I mentioned the setback in 1995 above. The next four years had expected results based on the strengths of the teams. In 2000, after two losing seasons, a new coach named Nick Saban came to town. He had mixed results his first year, which included an early loss to UAB and a characteristic blowout loss at the hands of Steve Spurrier’s Florida Gators. Kentucky proved to be no problem that year (the Wildcats had two non-conference wins but would go winless in the SEC), but the following two seasons would be adventures. In 2001, Kentucky started similarly: 1-4 with a win over Ball St. LSU had two convincing wins over non-conference opponents, followed by setbacks against Tennessee (in a close game on the road) and Florida (another blowout). LSU started out reasonably well, taking a 19-3 lead at one point and a 22-10 lead into the half. The tigers had scored in four of their first five possessions. The only failure to score had been a missed field goal. The two teams had exchanged interceptions late in the first half, but there was no major cause for concern. Kentucky must have made some adjustments on defense though, because LSU just could not move the ball down the field in the second half. It was still 22-10 going into the final third of the game, so at less the LSU defense had kept the lead. Not for long though. Kentucky, led by Jared Lorenzen, would engineer touchdown drives on consecutive possessions (he threw for 70 yards in the first drive alone) while all LSU could manage was a series of punts. After the go-ahead Kentucky touchdown with just over 8 minutes remaining, LSU still could not get a drive going, giving the ball back to the Wildcats with about 7 minutes left. Kentucky, with a three-point lead, drove to the LSU 44 before their drive stalled with 3 1/2 minutes to go. With the lead and the defense playing well, the Kentucky coach Guy Morriss stayed conservative and opted to punt on 4th and 1. Kentucky quickly got LSU into a 3rd and 4 situation, but LSU quarterback Rohan Davey all of a sudden had an answer to Lorenzen. Instead of throwing for 30 yards at once, he threw for shorter distances, but 14 yards on the third-down play was more than enough. After three more passes and two more first downs, LSU was in reasonable scoring position at the Kentucky 27. On the next play, Davey was sacked for a loss of 9 and it looked like the Tigers might not even be able to tie the game. He then completed a pass to his favorite target Michael Clayton for 18 yards, bringing up a third and 1. A pass to Clayton worked on the last third and less-than-5, so that’s what they did again, this time for 8 yards, bringing up a first and goal at the 10. Davey nearly ran it all the way in on first down, but that would have been scoring too soon, so he waited until third and six (after an illegal procedure and threw to Clayton yet again for the go-ahead score with 13 seconds left. After beating Vanderbilt to end its 15-game SEC losing streak, Kentucky would once again finish with only two wins. LSU was still inconsistent the next two weeks: a blowout win over a weak Mississippi St. team, followed by a disappointing home loss to Ole Miss, but then something happened the following week at Tuscaloosa. LSU beat a comparable Alabama team by 14 and would not lose again. The Tigers snuck into the SEC championship game, where they knocked off #2 Tennessee. Then LSU beat Illinois to finish 10-3 and win its first Sugar Bowl since 1967 That was an improvement of seven wins over two seasons before. But none of it likely would have happened has Kentucky won that game. LSU would learn pretty quickly in 2002 that you don’t just magically keep your spot in the pecking order. The Tigers lost their opener at Virginia tech convincingly. Then, the week before the Kentucky game, LSU was walloped by Auburn, 31-7. Kentucky, however, was much-improved and entered the game with 6-3 record, only two wins shy of their highest season win total since 1984. Also, they were to play LSU at home. The Tigers seemed to recover well to the loss to Auburn and played reasonably well on both sides of the ball. LSU’s offense wasn’t the greatest, but it went up 21-7 at the beginning of the third quarter, which isn’t bad against a winning team on the road. The Tigers still held onto to 24-14 lead with around 12 minutes left. Kentucky was driving in LSU territory and faced a fourth and 1. Not knowing how many chances they would get (and likely not wanting to repeat the mistake of 2001), Morriss went for it. Kentucky’s go-to back Artose Pinner easily ran for the first down, and this put the Wildcats within easy striking distance for Lorenzen, who completed a 25-yard touchdown pass to put Kentucky within 4. For some reason, they unsuccessfully tried for two. The craziness was only beginning. When LSU went three and out and punted, the Wildcat returner fumbled, allowing the Tigers to take over at the Kentucky 19. LSU got the ball to the two, but played it safe with a 19-yard field goal to go back up 7. Aided by three different first downs resulting from penalties, Kentucky drove right down the field for the tie with 2:24 to go. LSU then went backwards in its next possession and punted. A 21-yard punt return and face ask penalty for good measure put Kentucky back in scoring position. Another LSU penalty made it just a 29-yard attempt, which gave Kentucky the lead with just 11 seconds left. The Tigers took over at their own 13, and then seemingly in an effort to delay the inevitable, got a delay-of-game penalty. Randall completed a modest 17-yard pass to Clayton, and everyone thought it was over. It wasn’t over on the clock, but still, that’s not good field position for any type of scoring play. If you haven’t seen what happens next, just watch the video at the beginning of this blog. The winning streak had pushed LSU to a #1 ranking, which they had not held in the regular season since 1959 when the Tigers lost by a single point at Tennessee. Even though no players and few (if any) coaches were in common, the game followed a similar pattern to 2001 and 2002. Kentucky did score first, but LSU would go up 17-7 in the first half and 27-14 with 3:49 to go in the third quarter. 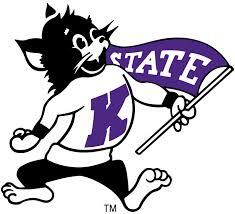 The Wildcats would score almost immediately afterward. Led by QB Andre Woodson, UK did not even face a third down on the touchdown drive. LSU had to punt on the next possession, but they nearly had a three-and-out defensively on Kentucky’s next set of downs. The Tigers were whistled for a pass interference that kept the drive going. The Wildcats would eventually reduce the margin to three points with just under 8 minutes to play in regulation. Two plays later, LSU QB Matt Flynn threw an interception way downfield, setting up the Wildcats at their own 37. After an incompletion on first down, the tired Tiger defense gave up passes of 11 and 35 yards. Kentucky tried to run down he clock a bit before kicking the tying field goal. LSU got the ball back with time for a winning drive, but it took 2:45 just to get to the Kentucky 40. Colt David was a good kicker with the Tigers, but 57 yards was a bit out of his range, so the game went to overtime. The Wildcats got the first possession, and the LSU defense shot itself in the foot again, it would have been second and 15 from the 30, but a roughing the passer penalty gave Kentucky a first down at the 15. Kentucky later faced a third and 8, but Woodson completed a 12-yard pass, which led to the touchdown. The Tigers had little trouble responding. It took just four plays to find the end zone, and LSU didn’t even face a third down. The next LSU offensive possession did not go so smoothly. The Tigers faced third and 19 after a penalty and a sack, but got back into comfortable field goal range. The Wildcats responded with a three-and-out followed by their own field goal, but then the LSU defense was expected to hold them again and could not. Actually, holding was the problem. After a Woodson incomplete pass on third and goal from the 6, the Tigers were whistled for a holding penalty. This allowed Kentucky a new set of downs, which led to the touchdown. LSU ran four straight running plays, and the game ended about a yard short of the first. No accidental Gatorade baths this time, Kentucky fans stormed he field and stayed there awhile. Maybe the team enjoyed it a bit too much,as they would lose four of the next five games. LSU would win 6 of the next 7 (the only loss to Arkansas, another team that would finish 8-5, also in here overtimes) on the way to it’s second BCS championship. In 2011, Kentucky, which was in the midst of a losing season under Brooks’ successor Joker Philips, did not spoil LSU’s next serious attempt at an undefeated season. In 2014, Kentucky had a better conference record than LSU going into the game for the first time since 1999, but they fell behind early and could never recover. It was 17-0 after about 9 minutes of play. The Wildcats responded with a field goad and kept LSU’s offense under control, but LSU would score twice in the final minute of the half to increase the lead to 27-3. LSU’s return trip to Lexington should have been in 2012, but that was Missouri’s and Texas A&M’s first year in the SEC, so it went to a 6-1-1 rotation, which means 6 divisional games (as a result of the seventh team being added to each division), one permanent opponent, and one rotating opponent. So rather than 2 spots rotating among five teams in that last number, one spot rotates among six teams. I’m not sure why the 2014 game was in Baton Rouge rather than Lexington, but when a schedule change was made in 2002, Kentucky got two home games in a row, so maybe that’s part of the reason. Also, under the new format, one inter-divisional game is on the road and one is at home. It was clearly LSU’s turn to travel to Gainesville, so I guess having the Kentucky game at home was less problematic. Back-to-back games are not done under the new system, but there is still some uncertainty over the long-term scheduling format, so they didn’t insist that LSU and Kentucky wait until 5 years had passed. That may happen before the next game, however. 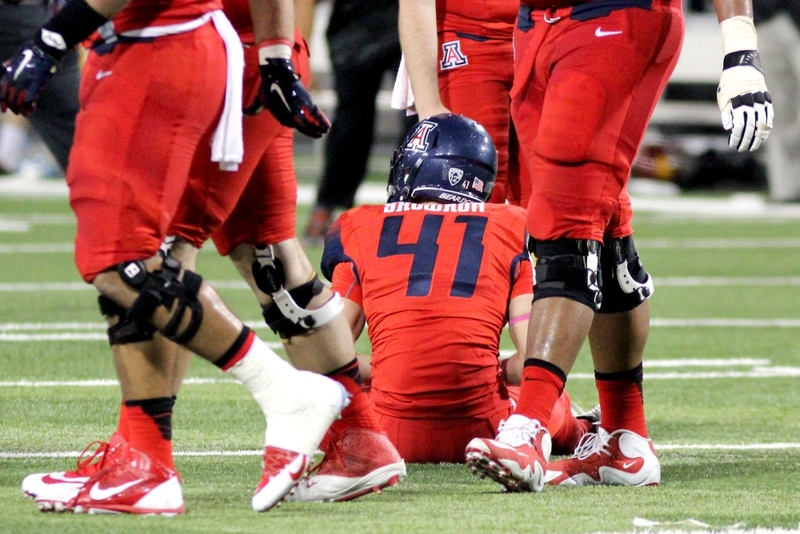 Arizona kicker Casey Skowron sits on the field after his missed field goal attempt reduced the number of undefeated FBS teams to six. Not to get too off-track, but the LSU game was about what I expected going into it. One of those goofy Les Miles games that we would somehow manage to win. LSU does not lose two in a row often. It’s only happened once since 2002. That was at the end of the regular season in 2008. I’ll get to my broader thoughts about that later in the week. For now, I’ve updated my LSU/Florida Rivalry blog. 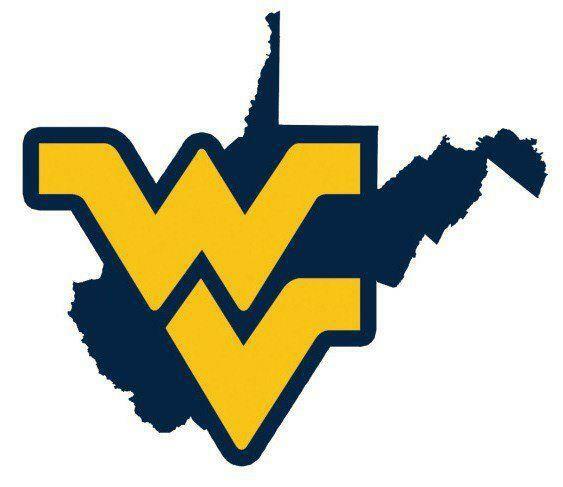 I’m working on one for Kentucky. I had done one back on TSN, but I was waiting until LSU played Kentucky again before doing it again here. A lot of people don’t realize that LSU had played Kentucky about 50 years in a row before the SEC reduced the permanent inter-divisional rivalries from two to one. Anyway, on the list above, I am putting Florida St., who had been my preseason top team, #1 for now. It depends on how other teams do, but it’s possible that Florida St. could beat Notre Dame and become #1 in the computer rankings, so I don’t want to jump them over Mississippi St. when I might just have to reverse it next week. Regardless, after next week, I think I can just go with my formula’s results. Kentucky isn’t a bad team, but I doubt they’re much of a threat to Mississippi St. a week from Saturday, so I don’t see the point of prolonging it any longer if the Bulldogs are still the computer #1 after the result of the FSU/Notre Dame game. I’m glad that the major polls were willing to put them there though. I was worried the voters would be too deferential to Florida St. until they lose (if they lose). Lower down, I found it interesting that I have one of the win chains in order, and the major polls do not. Arizona beat Oregon, who beat Michigan St., who beat Nebraska. Looking at the polls, you would think Michigan St. beat Oregon, who beat Arizona, who beat Nebraska. USC doesn’t fit in, but don’t forget they have two losses, not just one. There were a lot of losses and bye weeks by low-top-25 teams last week, so that explains the turnover, but the highest team that fell out (Missouri) was only #18. Georgia, the team that beat Missouri, is the only new team that rose really high; but they were a close #26 last week, and they were the only team in that vicinity with a good win. USC also made a fairly large jump, from nowhere to #16, but that can happen when you beat a previously unbeaten team. The Pac-12 overall strength of schedule is improving now that more of the top teams are playing one another. That phenomenon is why Mississippi St. and Ole Miss are so far ahead of the other unbeatens and Auburn is so far ahead of the other one-loss teams. Kentucky and Colorado St. might not be great, but as I said, there were a lot of losses lower down on the top 25 and even as you continue into the top 35. Kentucky was #29 last week, and Colorado St. was #34. 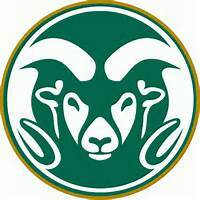 USC’s win had some effect upon Colorado St. too, since the Rams beat Boston College, who had beaten the Trojans. Duke also joined the top 25 by beating a previously unbeaten team, in their case Georgia Tech. The Les Miles combo of LSU and Oklahoma St. were only gone a week, so I don’t think I need to elaborate too much on those. Florida was #25 going in, and Oklahoma St.’s prior opponents had some mild successes to augment the Cowboys’ win over Kansas.